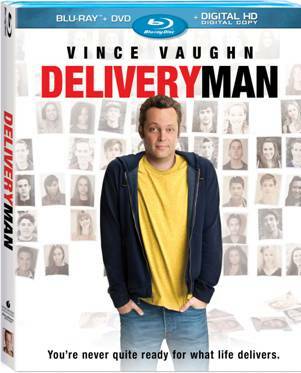 In this heartwarming comedy, underachiever David Wozniak (Vince Vaughn) learns he’s actually an overachiever — he’s fathered 533 children via donations made twenty years earlier! David soon discovers that the shock of his life might just be the best thing that’s ever happened to him. Along the way he discovers not only his true self, but also the father he could become. Also starring Chris Pratt and Cobie Smulders — and complete with bonus materials, including behind-the-scenes footage — it’s a feel-good movie that really delivers. Building Family: Explore the challenges and fun of creating this modern family, and learn how the 142 actors cast as biological siblings bonded during and after production. Vince Vaughn- Off the Cuff: Vince Vaughn is the master of comedy so when he says, “Do you want me to improv?” – yes, we do. Is it possible for a father to have 533 children? In the case of David Wozniak, the answer is a resounding yes. In the early 90s, David donated hundreds of times at his local sperm bank in exchange for cash. He continued on with his life as an underachieving, delivery driver for his family’s meat business. His life is turned upside down in the matter of a day when he learns this his estranged girlfriend is pregnant AND he is the father of 533 children! That is news you don’t hear everyday! It turns out that David’s sperm was of such “high quality” that the sperm bank used it over and over to impregnate hundreds of women in the early 90s. David is visited by a lawyer for 142 of his biological children who want to know who the man is behind his sperm bank pseudonym, Starbuck. David is given an envelope filled with the hundreds of profiles of his children who want to connect with him. His lawyer, who also happens to be his best friend, advises him to NOT open it. Of course, curiosity gets the best of him and who can blame him really? He opens the envelope and tacks them to a his wall face down. Then one by one he looks at the profile and then goes out to investigate. By now his children are not really children anymore and are young adults starting out their lives. It was heartwarming and sweet to watch him meet his children for the first time even though he never revealed who he really was. As much as I loved Vince Vaughn in this movie, my favourite character was actually his lawyer best friend, Brett, played by Chris Pratt. There were a few scenes where I howled with laughter….like when he was warning David to never have children! Both John and I laughed so hard we had tears in our eyes. Though this movie is considered a comedy, I would also say it felt a bit like a drama. Yes, there was lots of funny moments in it, but it also had some depth as David wrestles with the decision to come forward with his real identity of being “Starbuck”. Delivery Man is a feel-good type of movie that made me touched me emotionally and made me laugh in the same sitting. It’s not often a movie does that for me, but this one did! Sounds like a hilarious movie, I usually like Vince Vaugh movies but we didn’t see this in the theater. I heard about this movie before and it sounds like its going to be a funny one. Vince Vaughn is hilarious . Cant wait to see it . Thanks for the review. I haven’t seen this yet but it is on my list of ones to watch! Thanks for the review! I have wanted to see this movie since you first talked about the trailer debut and can’t wait. The plot seems so out there and unrealistic, but, on a smaller scale, it would still be quite a situation. Even if he had “only” fathered 10 to have that many children you didn’t even realize want to meet you….Wow! Then, add Chris Pratt, Vince Vaughn, and 100+ kids…sounds like quite a movie. I haven’t heard of this movie, but it is something I would love to see. Vince Vaughan is quite funny and I love a good laugh. As for the 533 children…hmmm, that’s really weird. He clearly didn’t have any worries of accidentally going out with someone and not knowing that it was his child. (Delivery Man Blu-ray Review) I have been seeing the TV commercials for this, and it sounds like it is going to be a pretty funny movie to see. Good one for my husband and I to watch together. I missed seeing this at the theatre and was wondering how it was. Thanks for the review. I will probably check this out. Personally not a fan of Vince Vaughn but it sounds like an interesting movie.